In Aztec mythology and religion, Xipe Totec ("our lord the flayed one") was a life-death-rebirth deity, god of agriculture, vegetation, the east, disease, spring, goldsmiths, silversmiths and the seasons. 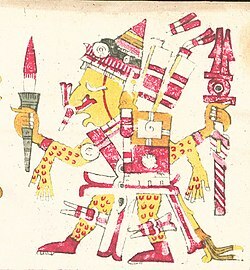 Xipe Totec was also known by the alternative names Tlatlauhca, Tlatlauhqui Tezcatlipoca ("Red Smoking Mirror") and Youalahuan ("the Night Drinker"). The Tlaxcaltecs and the Huejocincas worshipped a version of the deity under the name of Camaxtli, and the god has been identified with Yopi, a Zapotec god represented on Classic Period urns. The female equivalent of Xipe Totec was the goddess Xilonen-Chicomecoatl. Xipe Totec, the first son of Ometecuhtli and Omecihuatl, he flayed himself to give food to humanity, symbolic of the way maize seeds lose their outer layer before germination and of snakes shedding their skin. Without his skin, he was depicted as a golden god. Xipe Totec was believed by the Aztecs to be the god that invented war. He had a temple called Yopico within the Great Temple of Tenochtitlan. This deity is of uncertain origin. Xipe Totec was widely worshipped in central Mexico at the time of the Spanish Conquest, and was known throughout most of Mesoamerica. Representations of the god have been found as far away as Mayapan in the Yucatán Peninsula . The worship of Xipe Totec was common along the Gulf Coast during the Early Postclassic. The deity probably became an important Aztec god as a result of the Aztec conquest of the Gulf Coast in the middle of the fifteenth century. Xipe Totec is represented wearing a flayed human skin, usually with the flayed skin of the hands falling loose from the wrists. His body is often painted yellow on one side and tan on the other, although sometimes the body of the god is painted red under the flayed skin. He frequently had vertical stripes running down from his forehead to his chin, running across the eyes. He was sometimes depicted with a yellow shield and carrying a container filled with seeds. It is likely that sculptures of Xipe Totec were ritually dressed in the flayed skin of sacrificial victims. The worshippers of Xipe Totec emerging from the rotting, flayed skin after twenty days symbolised rebirth and the renewal of the seasons, the casting off of the old and the growth of new vegetation. The living god lay concealed underneath the superficial veneer of death, ready to burst forth like a germinating seed. The deity also had a malevolent side and Xipe Totec was said to afflict mortals with rashes, abscesses and skin and eye infections. The flayed skins were believed to have curative properties when touched and mothers took their children to touch such skins in order to relieve their ailments. People wishing to be cured made offerings to him at Yopico. The annual festival of Xipe Totec was celebrated on the spring equinox before the onset of the rainy season, it was known as Tlacaxipehualiztli ("flaying of men in honour of Xipe") and fell in March at the time of the Conquest. Annually, slaves or captives were selected as sacrifices to Xipe Totec. After having the heart cut out, the body was carefully flayed to produce a nearly whole skin which was then worn by the priests for twenty days during the fertility rituals that followed the sacrifice. The skins were often adorned with bright feathers and gold jewellery when worn. The Tlacaxipehualiztli festival both began and culminated with a "gladiator sacrifice" ritual. During the festival, victorious warrior wearing flayed skins carried out mock skirmishes throughout Tenochtitlan, they passed through the city begging alms and blessed whoever gave them food or other offerings. When the twenty day festival was over, the flayed skins were removed and stored in special containers with tight-fitting lids designed to stop the stench of putrefaction from escaping. These containers were then stored in a chamber beneath the temple. Some accounts indicate that a thigh bone from the sacrifice was defleshed and used by the priest to touch spectators in a fertility blessing. Paintings and several clay figures have been found which illustrate the flaying method and the appearance of priests wearing flayed skins. Stone representation of Xipe Totec. The mouth of the deity is visible under the open mouth of the flayed skin. Various methods of human sacrifice were used to honour this god. The flayed skins were often taken from sacrificial victims who had their hearts cut out, and some representations of Xipe Totec show a stitched-up wound in the chest. "Gladiator sacrifice" is the name given to the form of sacrifice in which an especially courageous war captive was given mock weapons, tied to a large circular stone and forced to fight against a fully armed Aztec warrior. As a weapon he was given a macuahuitl (a wooden sword with blades formed from obsidian) with the obsidian blades replaced with feathers. A white cord was tied either around his waist or his ankle, binding him to the sacred temalacatl stone. At the end of the Tlacaxipehualiztli festival, gladiator sacrifice (known as tlauauaniliztli) was carried out by five Aztec warriors; two jaguar warriors, two eagle warriors and a fifth, left-handed warrior. "Arrow sacrifice" was another method used by the worshippers of Xipe Totec. The sacrificial victim was bound spread-eagled to a wooden frame, he was then shot with many arrows so that his blood spilled onto the ground. Other forms of sacrifice were sometimes used; at times the victim was cast into a firepit and burned, others had their throats cut. Fernández 1992, 1996, pp.60-63. Matos Moctezuma 1988, p.181. Matos Moctezuma & Solis Olguín 2002, pp.54-5. Fernández 1992, 1996, p.60. Neumann 1976, p.255. Miller & Taube 1993, 2003, p.188. Matos Moctezuma & Solis Olguín 2002, p.426. Matos Moctezuma & Solis Olguín 2002, p.423. Milbrath & Peraza Lope 2003, pp.19, 23, 26. Fernández 1992, 1996, p.60. Matos Moctezuma & Solis Olguín 2002, p.422. Matos Moctezuma & Solis Olguín 2002, p.422. Matos Moctezuma & Solis Olguín 2002, p.468. Matos Moctezuma & Solis Olguín 2002, p.171. Matos Moctezuma & Solis Olguín 2002, pp.422, 468. Smith 1996, 2003, p.252. Matos Moctezuma & Solis Olguín 2002, p.422. Miller & Taube 1993, 2003, p.188. Matos Moctezuma & Solis Olguín 2002, p.451-2.